For the first time in years, Netflix is no longer the top grossing, non-game mobile app. Instead, that title now goes to dating app Tinder. The change in position is not surprising, given Netflix’s decision in December to stop paying the so-called “Apple tax.” That is, it no longer allows new users to sign up and subscribe to its service through its iOS application. App store intelligence firm Sensor Tower estimated Netflix had earned $853 million in 2018 on the iOS App Store. A 30 percent cut would have been around $256 million. However, after the first year, subscription apps only have to pay out 15 percent to Apple. But Netflix had a special deal, according to John Gruber — it only had to pay 15 percent from the get-go. In any event, it’s still a large sum. And one large enough to end Netflix’s reign at the top of the revenue charts. In Q1 2019, Sensor Tower estimates Netflix pulled in $216.3 million globally, across both the Apple App Store and Google Play, down 15 percent quarter-over-quarter from $255.7 million in Q4 2018. Meanwhile, Tinder’s revenue has climbed. In the first quarter, it saw revenue grow by 42 percent year-over-year, to reach $260.7 million, up from $183 million in Q1 2018. That put it at the top, according to both Sensor Tower and App Annie’s estimates. Beyond Tinder, Line and Line Manga, the rest of the top grossing, non-game apps in Q1 2019 were also focused on streaming, music and video, in Sensor Tower’s analysis. This included Tencent Video (No. 3), iQIYI (No. 4), YouTube (No. 5), Pandora (No. 6), Kwai (No. 7) and Youku (No. 10). Meanwhile, the top downloaded, non-game apps in the quarter were largely those focused on social media, messaging and video. This included, in order: WhatsApp, Messenger, TikTok, Facebook, Instagram, SHAREit, YouTube, LIKE Video, Netflix and Snapchat. TikTok, notably, has held onto its No. 3 position, having grown its new users 70 percent year-over-year, by adding 188 million in Q1. The growth was driven by India, where 88.6 million new users joined the app, compared with “just” 13.2 million in the U.S. — or 181 percent year-over-year growth. 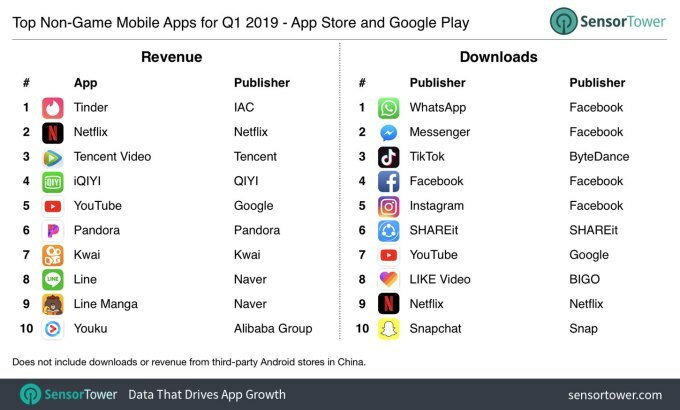 TikTok also did well on the revenue side thanks to in-app purchases, though not well enough to start ranking in the top charts. User spending was 222 percent higher in Q1 2019 versus Q1 2018, reaching an estimated $18.9 million worldwide. 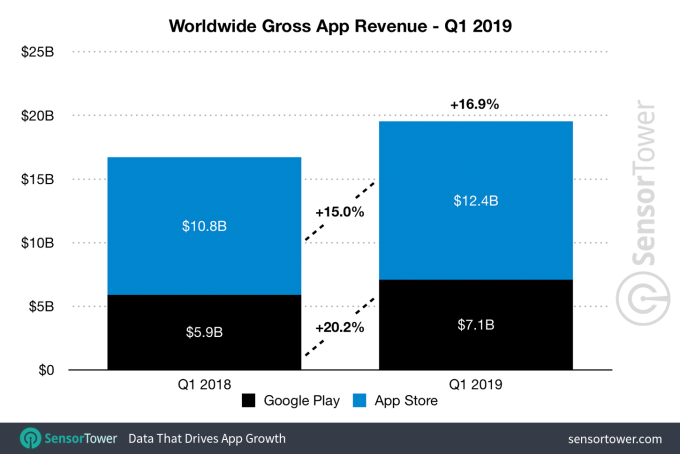 Overall, Apple’s App Store accounted for 64 percent of revenue in Q1, with consumer spending reaching $12.4 billion compared to Google Play’s $7.1 billion. 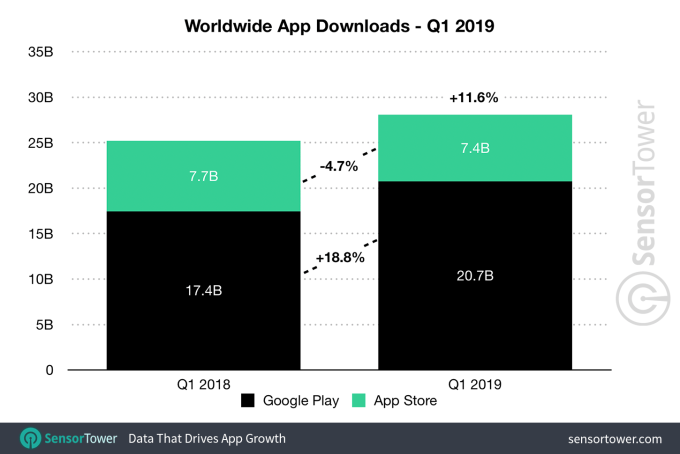 New app downloads slowed on iOS in Q1, decreasing 4.7 percent year-over-year, to 7.4 billion, while Google Play downloads grew 18.8 percent to 20.7 billion.